Doperunner, first, by God is that a cool band name. Then, isn't this what grindcore is supposed to be about, loud tracks with a few slowed down passages for flavor? Unholy blasts torn from the crypt? The kind of heavy metal redemption that will give these bands the triumph they need and deserve. 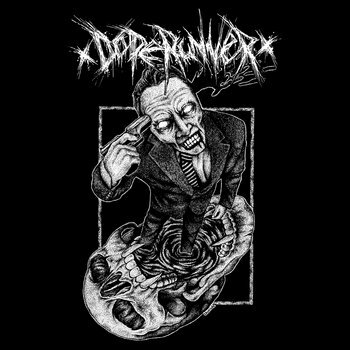 Doperunner prove that they understand the primitive brutality of a world that has failed them. Their is a wonderful primeval feel to the sound of Doperunners music, something that is really distilled on their new record xDOPERUNNERx. As they blare through highly ideological and oftentimes political tracks like Knuckledragger and Vegan For Status you realize that these guys truly understand what punk and by extension grindcore and powerviolence should be all about. With unholy vocals and a dedication to riffs that will knock your head off, Doperunner are showing no mercy, but merely turning it up louder, heavy metal to melt the soul, no redemption for rock and roll.